You are currently browsing the category archive for the ‘Liverpool’ category. What makes a place a Lost Promenade? Oh yes, the sea, but what about estuaries? The Thames, the Medway, the Mersey? In an estuary town, the ocean is still present; you can almost hear the waves if you strain your ears and you can almost smell the brine if you flex your nostrils. Just like in a seaside town, the way out is always visible but you can choose to stay lost. Towns and cities on estuaries grow different stories to seaside resorts. Lost riches, lost empires, lost lives of those who suffered under those empires, lost pride, lost sense of purpose. Not the full story of course; places develop and start to tell other stories, but it’s there in the background. The ghosts and the whispers. And beyond it all, still the sea – tumbled and tamed into a river, lassoed and domesticated like wild horses. 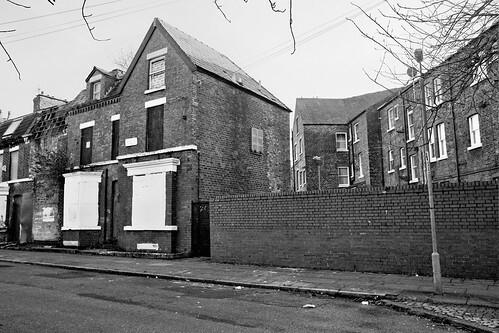 Within 5 minutes we come upon a bewildering sight – street after street of boarded and tinned up houses. 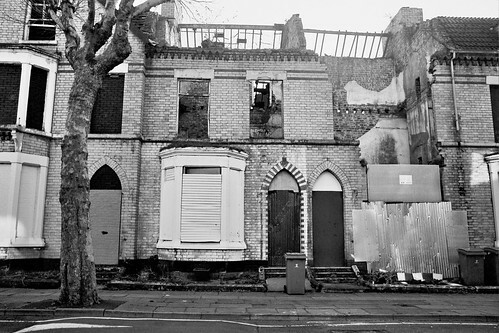 We are baffled: rows and rows of empty Victorian houses stand in desolate lines like war graves. Have they been condemned? 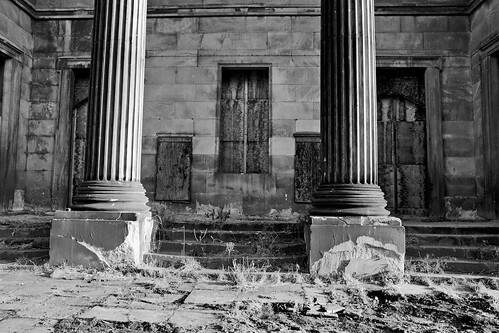 Why would lovely buildings like these need to be pulled down? We walk down Cairns Street and notice something else. Although many of the houses are abandoned, these streets are obviously tended to and cared for. 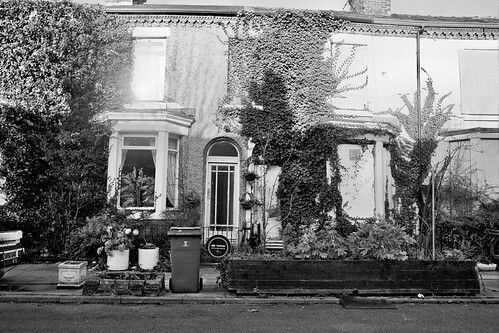 Here and there a house is still lived in, but between the metal-plated windows, despite the winter, the street is green with plants. Flat-bed trucks filled with planters, colanders as hanging baskets suspended from hammered-shut doors. Down Beaconsfield Street, the window boards have been painted with pastel curtains and the dead doors with trompe l’oeil panels. These streets are not yet deserted. We ask the first person we see what’s going on. She’s in a hurry, on her way out, but she gives us a quick summary. 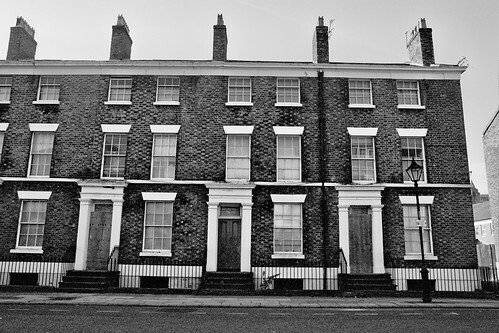 These are the Welsh Streets, and are part of the Granby Triangle in Liverpool 8. 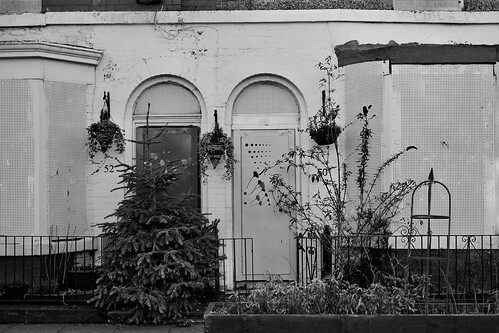 The houses have been like this for close to 20 years, one by one bought by the council and then left to rot by successive regimes. 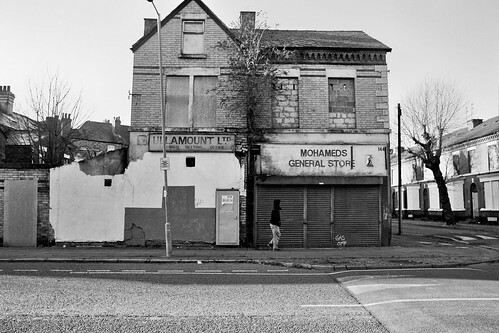 In 2004, the Pathfinder Scheme started attacking cities in the Midlands and the North. 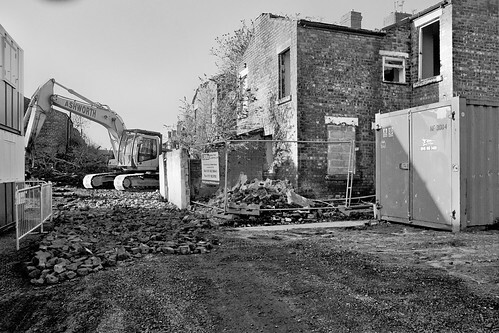 The scheme was an attempt to solve a perceived problem of depopulation in these areas by demolishing old housing stock and thus raising housing prices. 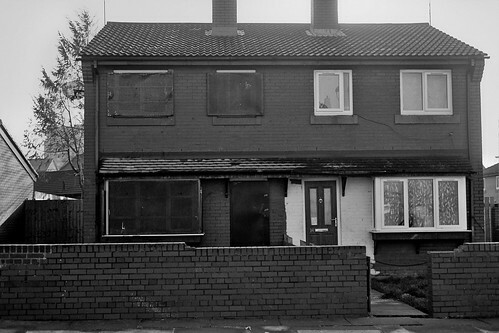 However, in Liverpool, there was actually a shortage of housing and many of the houses in the areas earmarked for demolition were still inhabited, and despite the fact that some had been lying empty for years, were mostly still desirable homes in good condition. Communities existed here and people loved their homes but were being forced out. The fight to save the Welsh Streets started. Beneath the paving stones, the beach, but above these paving stones grew gardens. 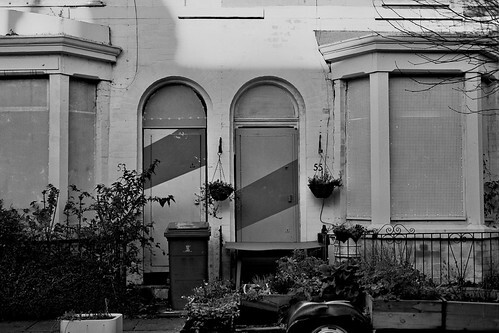 Residents decorated the houses and roads, organised street markets, protests and petitions, chased away the bulldozers – anything to save their community, their homes and a slice of Liverpool’s beautiful architectural heritage. The woman in a hurry says we’re welcome to come and call on her in an hour’s time once she’s got back, so she can tell us more. This openness isn’t a one-off, the next person we speak to, this time in Beaconsfield Street does invite us in. We’re blown away by how friendly people are, and the couple who live in this house – Archer and Melina – are unique characters. They helped to paint the empty houses opposite them, with Archer adding his own special touch of a black kitten peeping out from behind a curtain, as the house in question is home to a family of feral cats. Archer is a talented craftsman and Melina a fizzing bubble of feistiness. Offering us “tea, coffee, wine or vodka”, we learn more about her and Archer’s lives in half an hour than you’d usually learn in a month. Trials with contractors, their clawfoot bath which they used to keep fish in, and its missing brass ballcock, Melina’s shrine to her Chinese father with its miniature bottle of Bells Whiskey, their trip to Brighton and Melina’s “poppy dress”. We’d like to hear more, but we don’t want to trespass on their kindness for too long. So will the Welsh Streets be saved? In 2010, Pathfinder funding was cut and it looked like the fight may have been won. 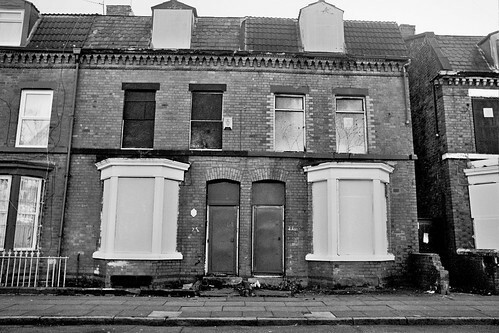 A website campaigning for regeneration of the area, www.welshstreets.co.uk , reports that by then, Merseyside had 13,000 empty homes, and 23,000 people seeking housing. And all this time, scores of family homes had lain wasted and empty, taken over by spiders and spores. 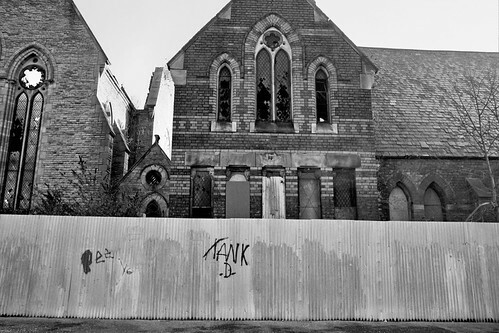 The people we speak to during our visit tell us that hopefully the threat of demolition (except for the most decrepit houses) has been staved off and there are now plans to refurbish the houses instead. However, since then there have been worrying developments. 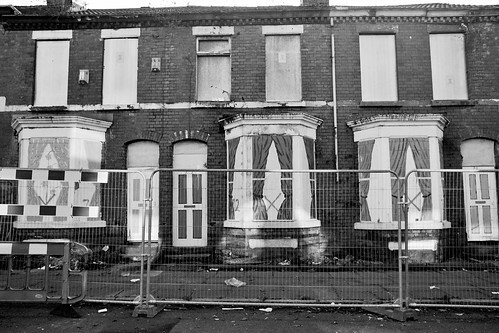 A freedom of information request has revealed that Liverpool council has received government funding to demolish 2,369 more homes on Merseyside by 2018, which includes the houses on the Welsh Streets. 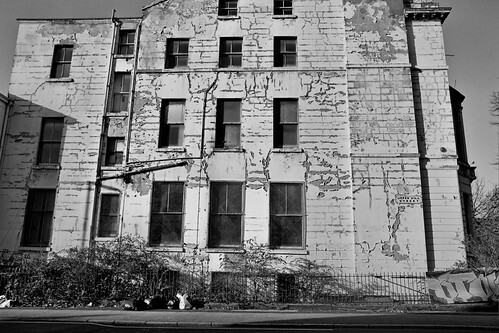 Refurbishment has not been addressed, and a large amount of the funding, which could have been better spent on bringing perfectly decent houses back to life will be spent purely on destruction. Who stands to gain? Developers and housing associations. Who stands to lose? The city of Liverpool. This is a crime of incredible waste and massive disdain for ordinary people. 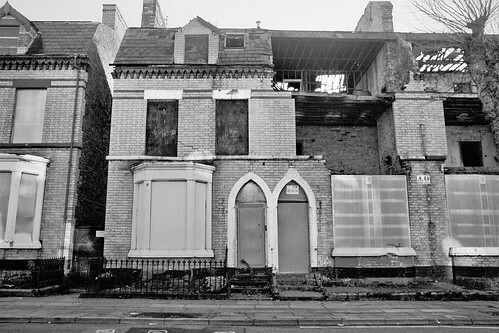 The fight continues and the residents of Toxteth aren’t ready to give up yet. The Lost Promenade will be following their fight. After we leave Melina and Archie, we walk past more dereliction. 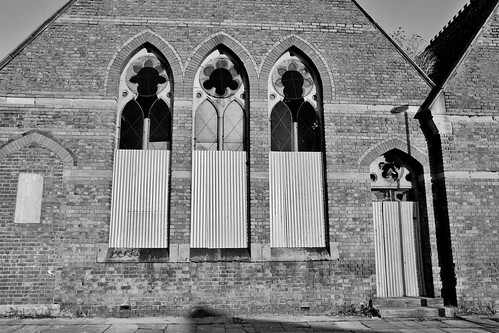 Closed-down shops scrawled with “gas off”, empty crumbling churches. Into the city centre and it too has a slightly decimated air, thanks to the sterile new shopping centre, Liverpool One, that has left once bustling, architecturally rich streets looking forlorn and forsaken. We eat lunch and we have a tremendous time in the city’s many ace vintage shops. However it’s now time for something completely different – a visit to the brand new Open Eye Gallery, a photography gallery on the new Mann Island development on the waterfront. This area couldn’t be more of a contrast to the neglected Liverpool that we saw in Toxteth. The gallery building is a huge, black shiny jagged block, like an arrogant shark baring its teeth at the venerable old dockside structures. The development has been controversial, however the gallery itself is excellent. The current exhibition is curated by Martin Parr, and features the show ‘Richard and Famous’, a collection of snapshots a man called Richard Simpkin has taken of himself with various celebrities, ever since he was a teenager. He started as a fanboy, but his hobby developed into a project, and the photos act as a self-portrait, charting his changing appearance over 23years as he ages, along with the celebrities. As we leave the building, a man calls out to us “Did you enjoy the exhibition?” And it’s Richard Simpkin himself! We have to do it – we ask to have our photo taken with him. Two photographic projects collide. And with this incident, two contrasting Liverpool narratives collide. On the one hand, decay and neglect, on the other, celebrity and brash confidence. With a frighteningly evil Tory government controlling the country; a political party that has always disdained Britain’s Northern cities, Liverpool’s immediate future doesn’t look too rosy. 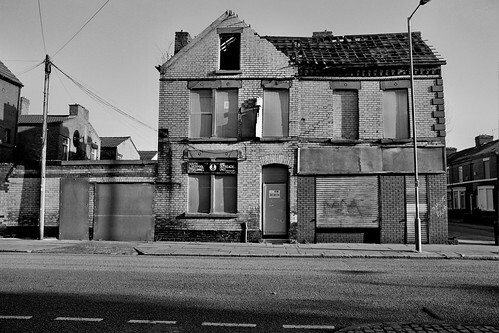 The Welsh Streets are a cautionary tale for new developments. Today’s flagships can easily turn into tomorrow’s shipwrecks.